Match Worn Shirts and Football Memorabilia for Sale. The words 'football' and 'investment' may not always appear together in the same sentence, but one area where football has proved to be a shrewd investment is in the field of memorabilia and particularly match worn players' shirts. The huge growth in the game's popularity has been matched and in many cases exceeded by the growing prices of genuine collectible items. Pele's match worn shirt from the 1970 World Cup final sold at Christie's of London for £157,150. Geoff Hurst's England shirt fetched £91,750 and was recently sold on for over £300,000. George Best's Manchester United shirt sold for £28,000. Diego Armando Maradona's 'Hand of God' shirt has been valued at £300,000. Bobby Moore's shirt from the 1970 World Cup against Brazil sold for £59,750. If you are interested in investing, it is well worth noting that there is a huge, global market for Premiership players' shirts in Southeast Asia, particularly Hong Kong, Thailand, Singapore and mainland China. The largest Manchester United supporter's club branch in the world is in Beijing, China and the second largest Manchester United supporter's club is in Shanghai. If your favourite team is Everton, Manchester City, Chelsea, Arsenal, Real Madrid or Barcelona - fear not, because there are other people who are equally passionate about these teams. Therefore, to buy shirts from players or teams you like is a good way to invest because when you come to sell you will find a great deal of interest from other people who support your team. The big plus for any of these items is their uniqueness - they can never be replicated. 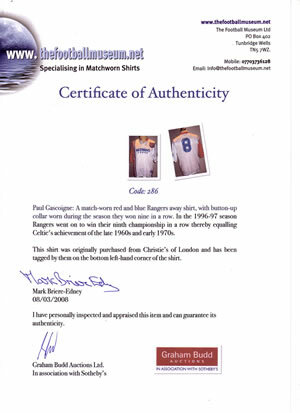 All of our match worn shirts have been authenticated by both Christie's and Sotheby's of London. Recent Additions to the Football Museum! We will also be introducing a membership scheme for customers who have already bought items from The Football Museum. Accomodation in luxury service apartments next to Harrod's, theatre tickets or The Comedy Store (Friday or Saturday) and dinner reservations at some of top restaurants in the city. Something for the Wife!